Ethiopia’s ruling party needs “fresh forces” in its leadership to tackle political upheaval and achieve its economic goals after Prime Minister Hailemariam Desalegn’s surprise resignation last week, a leader of his party said. Hailemariam, 52, announced Feb. 15 he’s stepping down after an internal evaluation of the South Ethiopia People’s Democratic Movement, one of four parties that make up the ruling Ethiopian People’s Revolutionary Democratic Front, said Tesfaye Beljige, secretary-general of the SEPDM. Hailemariam tendered his resignation “on the basis of the national situation and especially the current political situation” and not because of “his failure to perform individually,” Tesfaye said. The prime minister told the front’s leadership that he has faced a “very hectic situation” over the past six years, Tesfaye said in an interview Sunday in the capital, Addis Ababa. Ethiopia’s government declared a state of emergency on Feb. 16 following Hailemariam’s resignation, which came after more than two years of sporadic, often deadly, anti-government demonstrations and amid conflict between the Oromo and Somali regions that has displaced more than 900,000 people. Similar measures introduced in 2016 failed to curb the turmoil mainly in the Oromia and Amhara regions -- home to the biggest ethnic groups who say they’re excluded from political and economic power. In a policy shift, Hailemariam last month announced that more than 7,000 political prisoners would be released and further political reforms would be implemented. The suspension of the constitution will continue for six months and be extended if necessary, Defense Minister Siraj Fegessa announced on Feb. 17. Siraj, who didn’t respond to two text messages and two calls seeking comment, dismissed “false rumors of a military takeover of the government,” according to ruling party media outlets. The EPRDF and SEPDM’s executive committees have accepted Hailemariam’s resignation. They’re now preparing a letter to be submitted to an EPRDF Council that contains 180 members from the four parties, which will then decide whether to accept it, Tesfaye said. 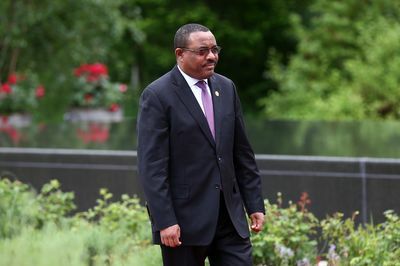 Hailemariam will remain the country’s leader until then, he said. Information Minister Negeri Lencho didn’t respond to two text messages and two calls seeking comment on when the council is expected to make a final decision on the resignation. Zadig Abraha, who heads public relations in the prime minister’s office, declined to comment on party procedure.